In 1943 Italy surrendered to the Allies in World War II. The partisans in Yugoslavia immediately proclaimed the union of Istria and Croatia, and that union was quickly extended to other regions in Croatia as well. In 1945 the German troops retreated and the union was implemented. 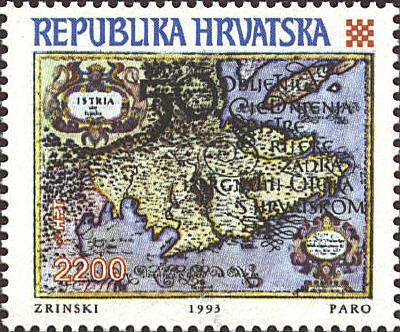 The stamp shows the peninsula of Istria oriented with North to the left. It was issued to celebrate the Fiftieth Anniversary of the Union of Istria, Rijeka, Zadar and the Islands to Croatia. The map was published in Bologna in 1620.